This free family and youth event celebrating Pacific Wildlife Care’s 30th anniversary will feature many native animal ambassadors – owls, hawks, falcons, and provide live entertainment reminiscent of a European Street Faire with jugglers, unicyclist, clowns and stilt performances. Discover more about wildlife through arts and craft projects, stories, games, skits, a scavenger hunt and a children’s dress up as a wild animal parade. Food is available for purchase. 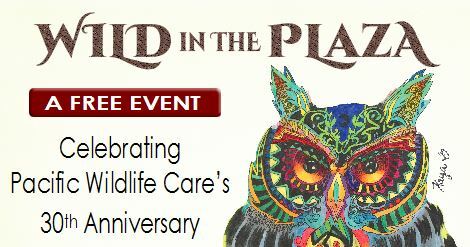 30th Anniversary, Special Event, Wild in the Plaza!